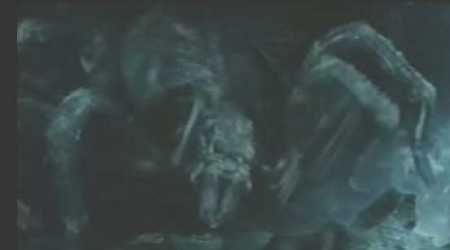 Shelob is a old large spider-like creature whose Lair is located in the High Pass of Cirith Ungol above Minas Morgul. Gollum forged some sort of alliance with her when he was lurking around Mordor before he was captured and taken to Barad-dûr. After Frodo led Gollum into being captured by Faramir and the Gondorians, Gollum felt betrayed and decided to lead the two Hobbits to Shelob. He tricks Frodo into sending Sam away and then leads Frodo into her Lair. Frodo is able to escape, but after Gollum unsuccessfully attacks him, Shelob sneaks up on him and pricks him. She is driven off by Sam, who returns to Frodo's aid, before she can take Frodo into her Lair.